This is a pair of earrings that I whipped together in ten minutes or so. I bought two pairs of earrings ,one pair had the bow part and one pair had the pearl drop. I cut the drops loose and put them on a new pair of hat pins that I attached to the bows. In the background you can see a glimpse of my engagentes that are made of a very fine cotton lace. I attached them to my chemise sleeves with very big whip stitches so they are easy to take of if I need to. Too pretty! 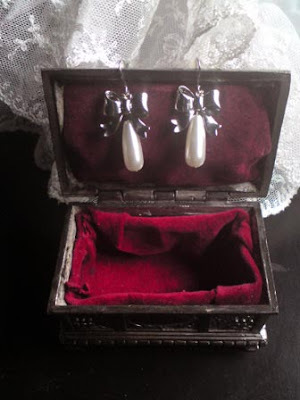 I must make something like it myself, I don't have any earrings and I just couldn't find drop-shaped pearls last time I hunted for them. But that was many months ago, maybe I'll have better luck next time. The lace is also beautiful, overall a very, very pretty photo! Söta och fint foto också! helt underbara! de är säkert fantastiska till din stil. Mdme Berg >> Thank you. gosh! theyre too cute, i want a pair too!